March 24th Stations of the Cross: A procession led by the images of the Gran Poder and La Dama de los Dolores, leaves La Merced Church at 6 p.m. This procession goes through the streets of the historical district and makes 14 different stops in homes of people where altars have been erected. These altars consist of a cross adorned by Sacuanjoche (plumeria) and Corozo flowers. 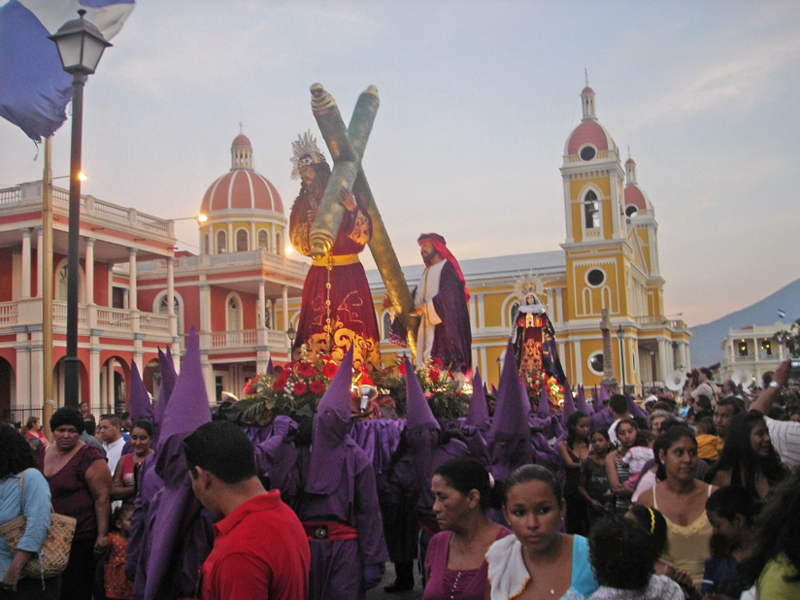 In Granada, the Via Crusis’s processions are very popular, even many people from other departments of Nicaragua and other countries come to visit this tradicional event. These processions take place in most of the Parishes of Granada, including one of the most popular and original Via Crusis known as Via Crucis de Las Isletas that leaves on Holy Monday. March 26th Procession of the Good Shepherd (Procesión del Buen Pastor): On Holy Monday at nightfall, the procession of the Good Shepherd begins in La Merced Church. You can take amazing photos !. 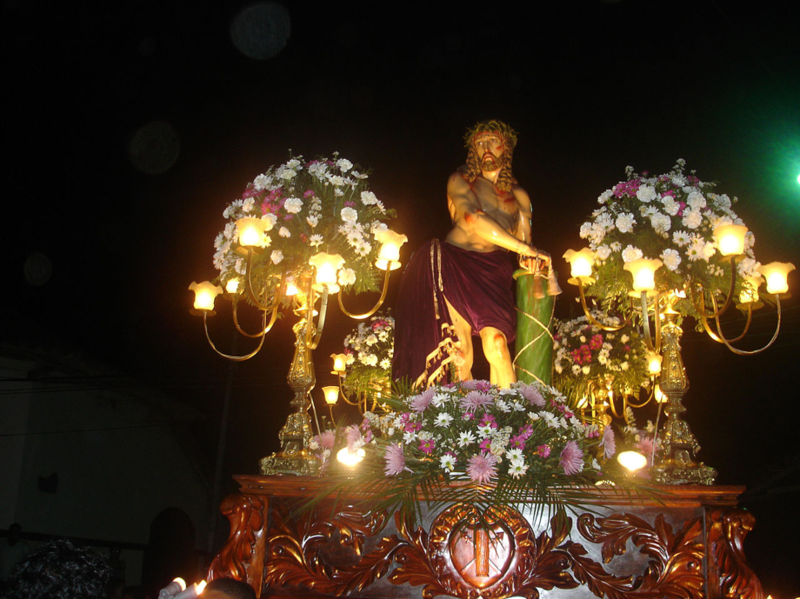 March 27th The Procession of the Great Force (La Procesión de la Gran Fuerza): This procession is very particular since all the assistants to the church wear robes with purple hood, they represent the Jesus’s captors. 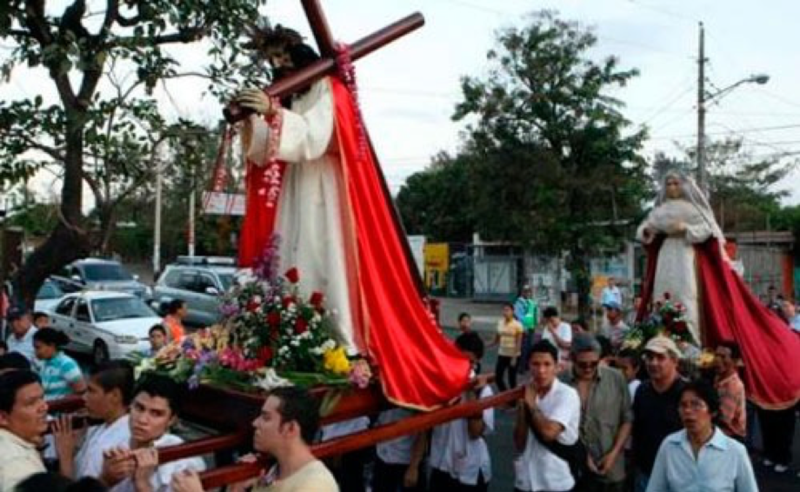 Holy Tuesday leaves La Merced Church at 6 p.m.
March 28th On the night of Holy Wednesday, from La Merced Church, the processional parade with the image of Jesus of the ‘Sweet Name’ tied to the column. It is one of the most representative images and of greater anatomical and corporal perfection of Nicaragua, it is completely of natural size and physically it is very precise in its body texture. 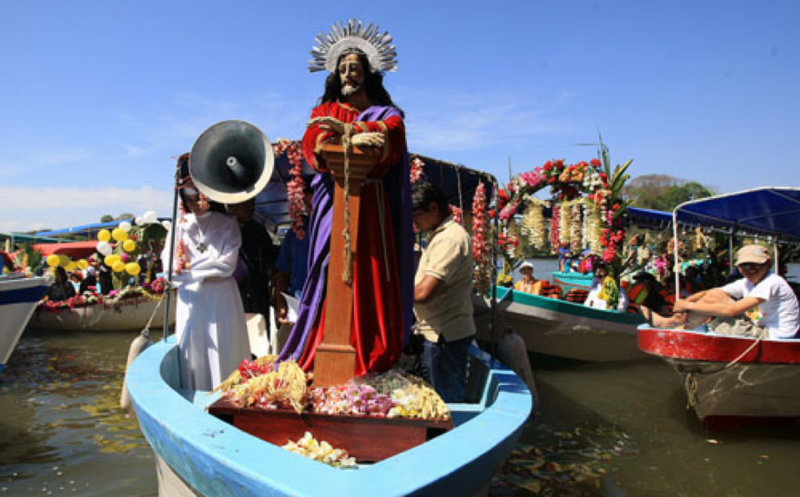 March 26th, 27th and 28th, Vía Crucis de las Isletas: A very popular and original event for the Granadinos, where many people, both national and foreign, participate. Instead of walking, they sail in boats to make 14 stops in the different docks of the 14 selected islands. This procession began less than 20 years ago when a priest and the island community decided to carry out the traditional procession. Nowadays it is a habitual celebration and once again more people participate. March 29th: The washing of the feet and the Silence procession: All the male parishioners meet at 5 o’clock in the afternoon and the priest washes them and kisses the feet. At 8 o’clock in the evening all the gardens are removed and the procession of silence departs. There are no drums or trumpets, everything is in total silence! The rest of the days there are always masses in all the churches of the city. Many people participate in the religious part of the festivities, the rest are near the water trying to fight the heat or just staying at home and enjoy their free time. If you are going to walk around the city, remember to put on sunscreen or walk in the shaded part of the street and bring water. We wish you a Happy Easter!